The Context of White Supremacy welcomes Jasmine Iona Brown. Ms. Brown is a Seattle, Washington artist and mother of a black son. 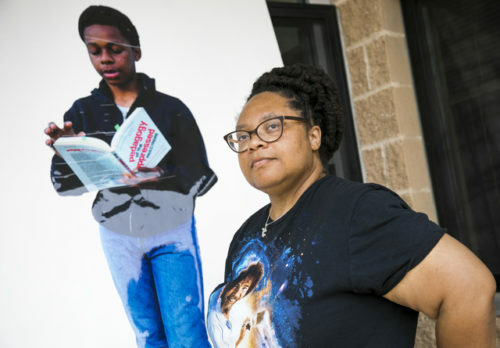 She recently had images of her teenage son, Jaymin, reading a book while wearing a hoodie – and homage to Trayvon Martin, who was killed in 2012, posted all throughout the Capitol Hill area of Seattle. Not long after, her portraits were mutilated, in one instance, her son’s image was totally defaced as if her has been devoured leaving only his sneakers. Ms. Brown’s artwork was replaced, only to be vandalized again. Tyrone Baason wrote about this incident for the Seattle Times, noting: “It’s unclear who’s behind the vandalism. But if this is how people respond to harmless pictures of her son, Brown wonders, how does that bode for Jaymin himself?” We’ll ask Ms. Brown how this incident has changed her understanding of White Supremacy. Incidentally, Gus is very familiar with this area of Seattle, as he’s been a Capitol Hill resident for nearly a full calendar year in response to the great flood of 2017. Any non white person I see or meet on the street, in shopping malls, anywhere, if there is an opportunity to communicate, will hear those questions. ” excuse me! have you heard of Dr. Frances….ect” it is a conversation starter for me to any non white person.